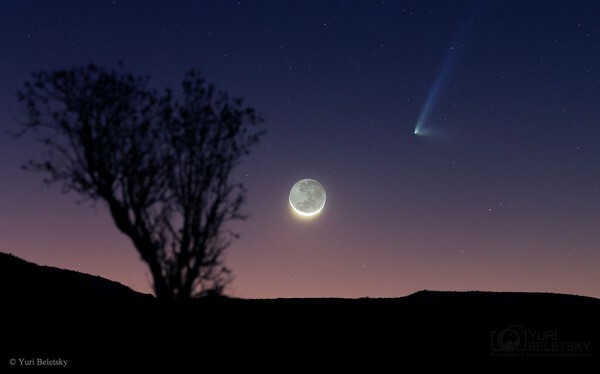 Despite appearances is not pulling Photoshop composition but a pretty picture with the moon and discovered comet C / 2014 Q1 (PanSTARRS) absolutely nothing (1 year). Said kite is visible to the naked eye for a few days (a few) by coordinates on this URL. In fact so bright they can be seen with nothing special, now, we are looking at the sky at night. To be exact, tomorrow is the day of better visibility of it, passing close to Jupiter. Tail gas well will be seen through the reflection of the sun. In fact, we will see Venus (let that be brighter). A unique opportunity. About the best time to see it will be at sunset. The biggest problem is that it will only be visible in the southern hemisphere… other time, will be.